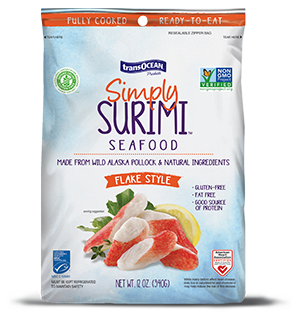 A breakthrough new surimi seafood product made using NO GMOs, added phosphates, artificial colors or flavors. This great-tasting seafood is certified gluten-free and certified sustainable by MSC and heart healthy by the American Heart Association. Make naturally fresh and delicious seafood salads, snacks and hot dishes with Simply Surimi.